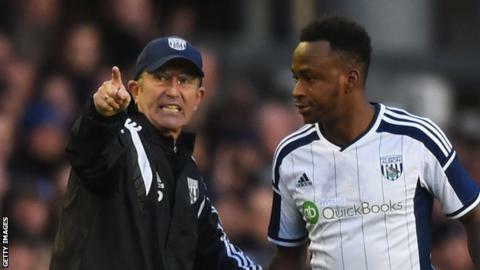 Manager Tony Pulis has praised West Brom fans for forgiving striker Saido Berahino for wanting to leave. Berahino, threatened never to play for the club again after chairman Jeremy Peace rejected two transfer deadline-day bids from Tottenham on 1 September. The 22-year-old scored the only goal in Saturday's 1-0 win at Aston Villa, his second game since asking to leave. "They've embraced him and brought him back into the fold - that naughty child," said Pulis. "Saido was concerned there might be a little turning of the tide, but they were absolutely wonderful when he came on against Southampton and last Saturday against Villa. "The reaction of the supporters and players shows there's good unity in the group. "What we need to do now is for him to concentrate on playing football, which is what he's good at." England Under-21 international Berahino was rested for Wednesday's 3-0 League Cup defeat at Norwich but is expected to start the Premier League match against Everton at The Hawthorns on Monday. Pulis made 10 changes for the defeat at Carrow Road, resting Gareth McAuley, Chris Brunt and Salomon Rondon after saying they needed a break. Pulis added: "Those players have had the opportunity to have an extra day off."